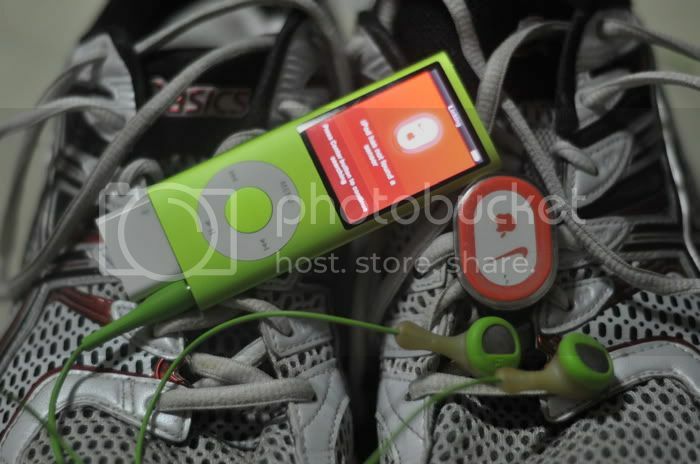 i just finished a good run around salcedo village with my friend yob. it was only 8 kilometers: sort of a warm-up for my 4-day trek through the ancient trails of kalinga during this holy week. i'm not catholic, but my version of penitence is to submit to the rigors of a difficult climb and be released from the sometimes suffocating grasp of technology and the modern comforts of urban life. in that case, i would suppose my sacrifices take place on a rather regular basis: i openly submit myself to these difficulties for the pure love of nature, adventure, and the exhiliration of teetering close to danger. if sacrifice meant staying away from these little joys, then my penitence would consist of doing nothing. sloth is also a sin, and i'm not catholic, nor am i religious, so i'm glad i don't have to deal with these choices. nevertheless, i began this entry talking about a run. since the beginning of this year, i've paid more attention to my running routine although i started out like a laggard, not putting in more than 5 kilometers at any given time. in fact, last saturday's 10k run was my longest non-event, non-BMC, solo run. i normally like running with a crowd because somehow you find inspiration in the throng, particularly when bigger people or people with more years on them overtake you. so going out and running for 56 minutes is a small internal feat: i nearly broke my PR in this distance, and i did it without pausing for a drink. i suppose when the sun is out, the need for hydration is a lot less, and exhaustion from heat is a distant possibility. there's a cool breeze out there even on these summer nights. it's funny how when i start running, normally the first 2 kilometers are the most difficult. i usually know from the beginning how far i can get, and last saturday was no exception: i knew i would probably run only 5k, which was already an effort of immense proportions. i just was not in the zone, and although two earlier recovery runs have helped my legs relax from the 15k of the previous sunday, i was unsure of my resolve to go farther. but along the way, amid bursts of speed when other runners totter by with their exaggerated hand motions, i would begin telling myself that i could do one more round, one more. so running becomes a study not just of my personal physiology, but also of my internal psychology: understanding what motivates me as i debate with myself, as parts of me quarrel with each other, as my brain detaches itself from the actions of my legs. and i went home only with a minor complaint: a burn formed on top of my achilles heel because my socks drifted and my shoe rubbed against my skin. how i endured that for over 3 kilometers is a mystery. 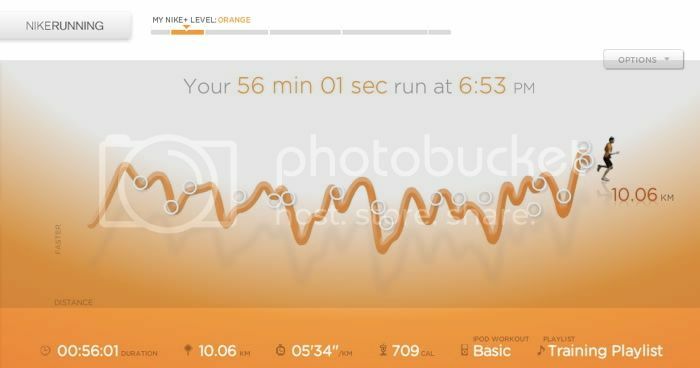 my nike+ has also been a very helpful tool in tracking my runs. it isn't a GPS so the feedback doesn't have pinpoint accuracy, but i am able to verify my actual distance on logyourrun, and since i've been patiently calibrating my sensor, i've found out that my nike+ is close to 97% accurate. my page on nikerunning.com has been purged of last year's lackluster training. there were serious gaps between pathetic runs that just did not look inspiring. i wanted to start afresh this year, with a slightly-better-than average pace of 5'45"/km, already a slight improvement to my usual 5'55"/km. still, i've pencilled in a goal to consistently run a 5'40" kilometer, since i've made it a dream to finish a half marathon in 2 hours. based on the training i've downloaded, i should be ready for that in may this year. 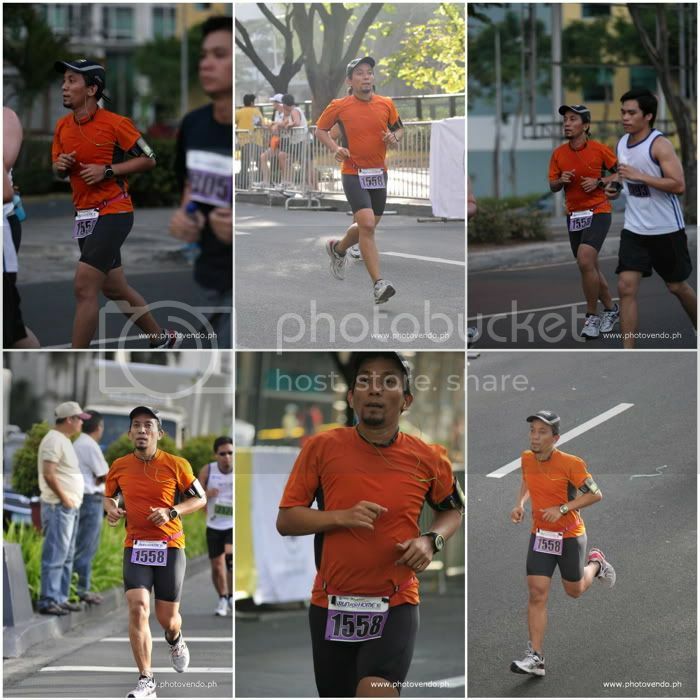 incidentally, photovendo.ph has released my race photos. my friend fabian pointed out to me that there may be some serious privacy issues involved. the waiver already includes an agreement to having one's photos posted on a public website where anyone may freely download pictures. there is no option not to agree to the condition, except maybe not wearing your bib or concealing it in a way that would prevent photographers from identifying you. now, i don't have privacy issues of my own since my pictures are literally all over cyberspace and this blog is more public than a park, so i don't worry about that (and i'm not worth stalking anyway). but others do, and fabian has a point: this really makes armchair stalkers even lazier. so anyway, i also discovered what a run analysis means, thanks to the globe run for home. i was conveniently given trivial information about my 15k: things that are interesting to know, though not necessarily encouraging, which sometimes may even be plain hogwash. 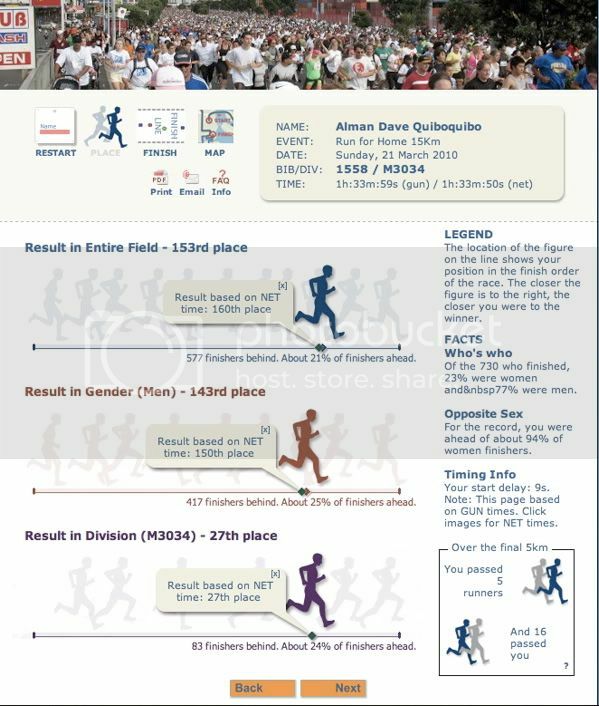 for example, i know i'm not anywhere near elite, but the analysis even points out where i was on the course when my category's winner crossed the finish line. at least i found out that i finished 27th in my division (male 30 to 34): apparently a very tough field! so, here's to running, and that sub-2 half marathon. 5:38/K hitad, and engage a stronger runner who will stick to that pace. At your age it can be done. and i thought i did the math already. i guess improving by 2 seconds per kilometer is possible. i managed to shave off a total of 8 minutes from my last 10k (the adidas KOTR), but i don't know whether i can hold this for any much longer. i'm really looking forward to doing a 21k in may or early june with a time i can be proud of. and if it's sub-2, well, why the hell not?